Shirts against Isolation Kateřina Šedá (born 1977 in Brno, lives in Brno and Prague) uses different media to initiate an artistic process. This exhibition presents several projects with installations, drawings, videos,... by the artist; one of these projects is titled after an Czech saying “Každej pes, jiná ves” (literally: “For every dog, a different village,” 2007). Šedá took an entire neighborhood as the object of her action, the “Plattenbau” concrete slab housing estate Nová Líšen in her hometown, Brno-Líšen, where the people live isolated from one another. Šedá produced 1000 shirts for 1000 households. 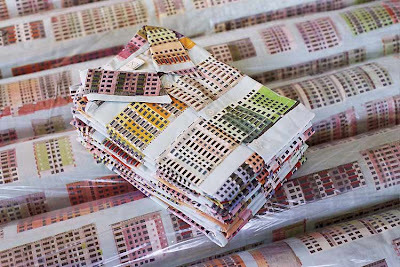 She designed a pattern for the shirts showing the colorful concrete slab buildings in a repeating pattern - in the style of textile diamonds. She paired up the families according to a formalist diagram that she created, based on the ground plan of the development, and then sent each household a shirt “from” their partner family. Through this, Šedá sets in motion the possibility of a meeting, in which she is, however, not personally involved. She directs, but then withdraws, leaving things to take their course.